Now that we have been given the go ahead to announce it, I can now say that I am going to be contributing to a “PowerShell Deep Dive” book with a number of PowerShell superstars! I am very excited about this to want to thank Jeffery Hicks for giving me this great opportunity to help contribute in yet another way to the PowerShell community. The details around the book will remain secret for right now, but I can tell you that it is going to be great! As it gets closer to the publishing time, I will post more information regarding it, so stay tuned! 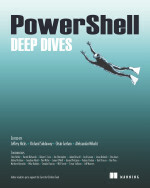 This entry was posted in Deep Dive, News, powershell and tagged book, deep dive, Powershell. Bookmark the permalink. Good to know that. You deserve it! !